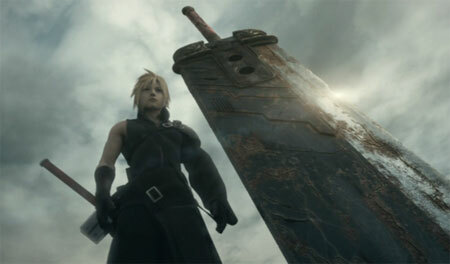 (background) Cloud Strife and (foreground) his massive sword in Final Fantasy VII: Advent Children. The super-popular PlayStation video game gets a long-awaited sequel, albeit in film form. Non-fans might be baffled by the film’s sometimes opaque storyline, but a constant flurry of undeniably dazzling CG graphics, a more than serviceable script, and a fun, bombastic soundtrack elevate this textbook example of “fan service” above the level of merely glorified cutscene. Review by Calvin McMillin: The 1997 PlayStation video game Final Fantasy VII, arguably the most popular entry in the long-running series, finally got a direct sequel in 2005, but not in video game form. Instead of debuting their follow-up on one of the latest next-generation consoles, the powers-that-be at Square Enix decided that it deserved the feature-film treatment. And thus, Final Fantasy VII: Advent Children was born. Set two years after the events of Final Fantasy VII, this cinematic sequel centers once again on Cloud Strife (Takahiro Sakurai/Steve Burton), the blond hero of the original game. Midgar is now beset by a mysterious plague known as Geostigma, affecting much of the city’s populace. While gunning his motorcycle around the wastelands on the outskirts of town, Cloud finds himself under attack by a trio of silver-haired bikers. Led by the lanky Kadaj (Showtaro Morikubo/Steve Staley), these punks are after one thing: their mommy. Okay, they call her “Mother,” although who that’s supposed to be isn’t clear at first. Still, they decide that the best method in staging a “reunion” with dear ol’ Mom is to unleash all kinds of hell on the planet. As such, the last forty-five minutes of the film is almost pure action-packed spectacle, as Cloud and all his old friends from Final Fantasy VII (Tifa, Barret, Vincent Valentine, etc.) do battle against Kadaj, his minions, and a gigantic monster that’d give Godzilla a run for his money. Of course, as any FFVII fan knows, there’s also badass villain Sephiroth to worry about, who appears complete with long, flowing silver hair, a gigantic katana, and a hard-on for killing Cloud. He’s supposed to be dead, but when does that ever stop a larger-than-life comic book villain? Although much has been said about how incomprehensible FFVII: Advent Children is, the storyline is actually pretty simple - it’s just the details that are a little complicated. Otherwise, the plot’s really about a group of bad guys who want something, and a group of good guys who have to stop them. The rest is window-dressing, which may be a problem for some. Perhaps the reason I didn't find it problematic is the fact that Advent Children is so visually arresting. The clothes and hair are practically photo-real, while the action set-pieces, all completely unconcerned with actual physics, are exhilarating to behold. Both the Japanese and English voice cast is topnotch, albeit with a slight edge going to the Japanese. Further, the score by Nobuo Uematsu adds the right level of suspense, poignancy, and dramatic bombast to enliven the proceedings considerably. Notes:  In 2009, Final Fantasy VII: Advent Children Complete was released with thirty minutes of new footage, revised CG, and – supposedly – a more easily digestible storyline.